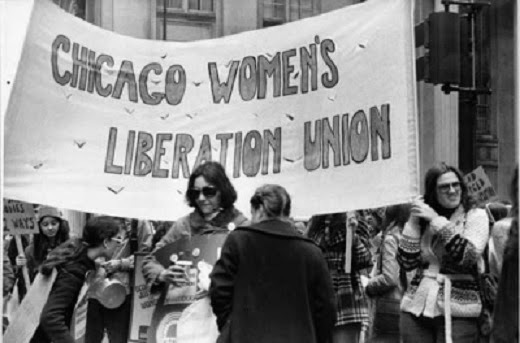 The Chicago Women’s Liberation Union, arguably the most significant of the socialist feminist women’s unions established during the “second wave” feminist movement, was formed in 1969 and played a leading role in the women’s liberation movement in Chicago during the 1970s. CWLU recognized that the liberation of women was not possible unless it also fought against racism and capitalism, and for gay and lesbian liberation. Chris Riddiough (right) became involved in politics in the 1960s as an anti-Vietnam war activist. She moved to Chicago in 1968 and got involved in the Chicago Women’s Liberation Union. She worked on Liberation School and Blazing Star and was on the steering committee and staff of CWLU. She has also been active in the gay and lesbian movement. She moved to Washington in 1983 where she now teaches computer programming and statistics. Margaret Schmid (left) was in the CWLU WOMANKIND work group, the speaker's bureau, and served as steering committee co-chair. She worked with public sector unions, first as leader in a public university faculty union in Illinois and then as senior staff with a large state employee union in Ohio. She subsequently did health care advocacy work focused on quality, access, and affordability. Now retired, Margaret lives in Chicago.